IBRAHIMPATNAM : ANDHRA PRADESH : : AMARAVATNI. 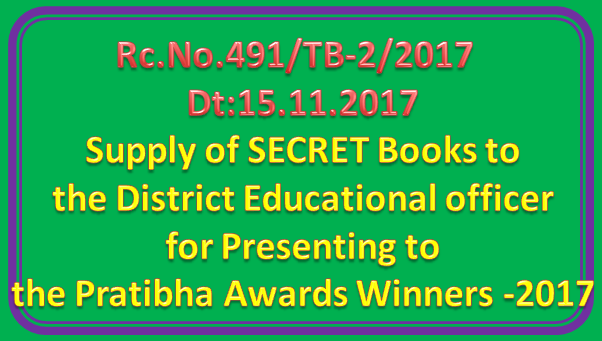 Sub: SE-Pratibha Awards -Supply of SECRET Books to the District Educational officer for Presenting to the Pratibha Awards Winners -2017 - Regarding. Ref: 1) Lr.Rc.No.491/TB-2/2017, dated:17.10.2017, of this office. 2) Mail received from the Ashoka Book Centre, Vijayawada. 3) This office Lr.Rc.No.491/TB-2/2017, Dated: 17.10.2017 & 09.11.2017. 4) Letter dated: 05.11.2017 of the Ashok Book Centre, Vijayawada. All the District Educational Officers in the State are Informed that that Government has decided to supply Secret Books to the Pratibha Awardees-2017. Further the Work order to Ashok Book Centre, Kanchu Kota Street, Vijayawada for supply of Secret Books was given vide reference 1 cited. Vide reference 3 cited the Ashok Book Centre, Kanchu Kota Street, Vijayawada was Instructed to supply the Secret Books directly to the District Educational Officers as per the allotment. The Ashok Book Centre, Kanchu Kota Street, Vijayawada has dispatched the above books by Navata Road Transport. Therefore all the District Educational Officers in the State are requested to receive the Secret Books as per their allotment and distribute to the Pratibha Awardees-2017 of their District and submit compliance along with acknowledgment in the following proforma and Copy of delivery Challan. Encl:- 1)Dlstrlct wise Allotted list.